Before starting Happy-Go-Lucky in 1999, Lisa trained at another positive-style training facility and worked with elementary school students as a sign language interpreter. She’s been teaching a variety of classes and doing private lessons for more than 20 years now. Lisa continues her education in the field by regularly attending classes, herding and agility lessons, and seminars – not to mention submersing herself in any new dog book she can get her hands on. Her most influential authors include Temple Grandin, Ray and Lorna Coppinger, Jean Donaldson, Turid Rugaas, Patricia McConnell and Ian Dunbar. When talking about why she does it, Lisa says, “I really enjoy working with people and their dogs. To see them begin to work together with increased understanding and confidence is incredibly rewarding – not to mention a lot of fun!” Lisa has three dogs, sheep, ducks and a llama that keep her busy on her farm in Battle Ground. Susan’s story begins with her hamster training at age 7. She started dog training at the curious age of 10, reading many books. After taking her first group dog training class in 1986, she began her apprenticeship and formal training in 1988. With us since the beginning, Susan teaches classes of all levels and offers private lessons to manage and lessen dog-to-dog aggression. She is also a Tellington Touch Practitioner (Level One). Susan’s reason for being in this career is simple: “I love dogs. I want them to have a good life and be understood and appreciated by their people.” Susan has added to her 20+ years of experience by attending several seminars and filling her shelves with breed and training books. She and her dogs also play flyball, and participate in competition obedience, weight pull and sledding. Brittan first got involved in this field when she brought home her first sheepdog, Sweden, to help out with her horses. Her life soon changed when Sweden became the focus, and she found herself at Happy-Go-Lucky nearly every week taking all sorts of classes. She’s now been training with us for almost 10 years, teaching Puppy, Beginning and Rally-O classes, which have been a big hit around here. Outside of her work with us, she also does volunteer work with guide dogs and provides dogsitting services (through Tri-Able Shetland Sheepdogs). Brittan loves working with animals and their owners, applying encouraging methods to make sure everyone is having a fun time. As for hobbies with her own dogs, you can find Brittan in the Agility, Conformation, Rally-O and Obedience ring. She also loves camping, trail riding with the horses, rafting and taking weekly classes. Born and raised in Corvallis, Becky’s love for animals shined bright at an early age. Growing up talking to animals, she was frequently referred to as “Dr. Dolittle”. She would gather her audience of friends and family and perform agility for them using makeshift household items with her family dog, Brandy. On Becky’s eighth Birthday, her Dad gave her a personalized apron to hold her dog treats titled with the words, “Becky, Official Animal Trainer.” She still has it to this day. Thankfully, she never outgrew this title. In 2004, Becky moved to Flagstaff to study Psychology and Sociology at Northern Arizona University. She stayed after graduation to spend the next eight years working for a local animal shelter, teaching dog training classes, implementing behavior plans, and helping thousands of homeless animals get a second chance at life. After 12 years away from the Northwest, Becky returned to be closer to her family and soon after joined our team to offer in-home private trainings and teach Puppy and Beginning classes. She brings a passion for the human-animal bond and a commitment to promote responsible pet parenting through proper education and positive reinforcement training. 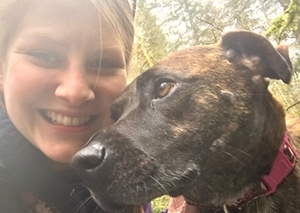 When Becky is not training and teaching, you will find her outdoors (rain or shine) exploring Portland with her reservation rescue, Savannah (an American Staffy Mix). Always the animal lover, Heather has been drawn to dogs for as long as she can remember. Although her family didn’t acquire a pup until she was 12, she spent every minute she could playing with and teaching the sweet and charming golden retriever. 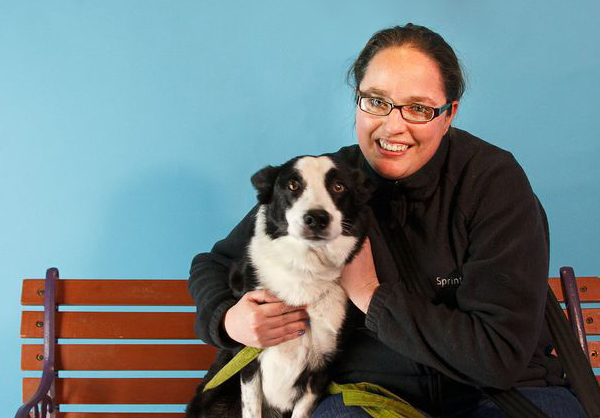 As soon as she was able, she got her own border collie and her world changed forever. Her desire to keep the intelligent and active dog busy drew her to start taking classes, dabble in herding and other dog sports, and fall into the world of dog training. Starting at Happy-Go-Lucky in 2009, Heather shares her passion for pups and training with all her clients. When not out with her dogs, Heather spends her free time reading, playing games or visiting with her family and friends. *Click here for more information about what it means to be designated “CPDT-KA”.